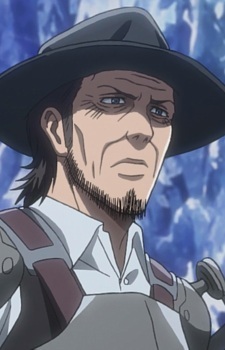 Captain Kenny Ackerman was a member of the Military Police Brigade's First Interior Squad and also the anti-personnel control squad. He was responsible for the murder of Historia's mother, Alma. In the decades prior to the events of the story, Kenny was an infamous serial killer that stalked victims in the Capitol. His preferred method of killing was to slit the throats of his victims which earned him his infamous handle "Kenny the Ripper", and it was rumoured that he murdered over 100 members of the Military Police Brigade. However decades later his killings ceased and the terror that he once inspired dwindled into an Urban Legend. Kenny trained a young Levi, though they parted ways Kenny became a member of the 1st Brigade due to Rod's brother taking an interest in him. It is revealed that Kenny's younger sister Kuchel gave birth to Levi, making Kenny Levi's uncle.